Daffodil International University (DIU) in association with Daffodil Computers Ltd. distributed 1500 DCL Laptop among the students under “One Student-One Laptop” project on Saturday (Jun 9) at 71 Milonayoton. Barrister Sheikh Fazle Noor Taposh, Honorable Member of Parliament, graced the laptop distribution ceremony as the chief guest and, handed over the laptops to the students. The function was presided over by Md. Sabur Khan, Chairman, Board of Trustees, DIU. The function was addressed by Prof. Dr. Yousuf M Islam, Vice-Chancellor, Prof. Dr. S M Mahabub Ul Haque Majumder, Pro Vice-Chancellor of the university. Hamidul Haque Khan, Treasurer of the university conducted the oath taking part of the ceremony where the students swore upon regarding the best use of the laptops in academic and education purpose. 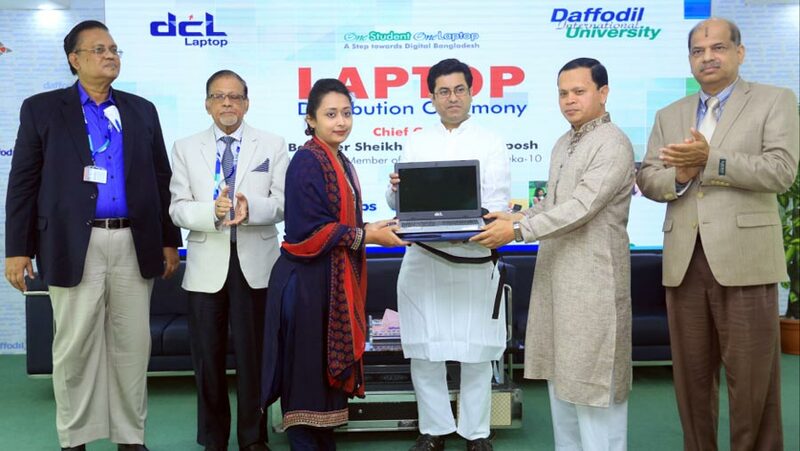 The authority of DIU in association with Daffodil Computers Ltd. has taken a gigantic initiative of “One Student: One Laptop” program which is one step ahead for digital Bangladesh from 2010. Every student admitted into DIU from Summer Semester-2010 and on ward is getting a laptop at free of cost. Till the date 23500 Laptops have been distributed so far. The laptop will help the students to equip themselves with proper technical knowledge so that they can survive, and secure respectable place in the society. Through this initiative DIU students will get the opportunity to implement digital Bangladesh concept. Addressing as chief guest Sheikh Fazle Noor Taposh said that DIU is playing the pioneering role to fulfill the dream of present government’s Digital Bangladesh for the last ten years ago. This university is providing the country skilled human resource by educating their graduates with adequate technology oriented knowledge besides academic education. Not only that, DIU is also preparing its graduates in such a way so that they can contribute accordingly to the development of the country. Sheikh Fazle Noor Taposh also said, laptop is not only an instrument of listening song or enjoying movie but it’s an instrument of connecting globally with skilled ICT knowledge. So he urged the student to prepare themselves keeping fit with the demand of global job market trend, he added. Sheikh Fazle Noor Taposh urged the students to be a dreamer and be confident to fulfill the dream. Md. Sabur Khan said in his presidential speech, one of the big challenges of DIU is to make an unemployment free country. To face that challenge, free laptop distribution plays a vital role to eradicate unemployment. DIU believes that by using this laptop student can make themselves as skilled person for future career life. He also said, technology is now a part and parcel of teaching and learning. He urged the students to be a potential ICT skilled graduate to contribute to the nation developing bright career ensuring proper utilization and application of the laptop. It is envisaged that DIU graduates can stand out by competing with other graduates both nationally and globally with their skill that they will acquire from this university. Sabur Khan said, DIU teaches its every student Art of Living, Employability 360 Degree and distributes free Laptop just only to prepare himself as skilled and keep fit to face the challenges of global market. Reminding proper utilization of the laptop, Sabur Khan said, DIU wants to see its graduates in a successful position with the best use of this laptop. Referring the example of Amazon and Alibaba, Dr. khan said, founder of Amazon Zef Bezos is currently declared as the top richest man around the world. As you know, he started his e-commerce business through a computer. Founder of Alibaba Jack Ma failed lot of times in life. But, he never depressed and disappointed. You can success if you try, he added.